The Department of MEDICINE, Medical College Baroda provides tertiary level care to patients with a multitude of medical problems, across the range of internal medicine and its various subspecialities. The department is recognized by the Medical Council of India for undergraduate and postgraduate studies in Internal Medicine. The outpatient department operates from OPD-18 located on the ground floor on the common OPD building. The OPD includes a daily general medical OPD besides various speciality clinics viz. cardiology, neurology, and diabetic clinic running on designated days in a week. The ART (Anti retroviral therapy ) center also via OPD 26. The indoor admissions are made to wards , located 1 through 6 (for male patients) and wards 7, 8 and 12 (for female patients) in a separate complex. The department receives patient referral from nearing districts of central and south Gujarat, Madhya Pradesh, Maharashtra and Rajasthan. The indoor facility of the department also includes specially designated Intensive Care Units- both medical (MICU) and cardiac (ICCU)- 12 bedded each. The units are having state-of-the-art ventilators, both invasive and non invasive, multipara cardiac monitors, and invasive hemodynamic monitoring, defibrillators, blood gas analysers and the like. A separate Nephrology unit has facilities for both hemodialysis and peritoneal dialysis round the clock. The medical service also extends to the trauma center, where emergency medical patients are treated, as also in emergency ward(ward 20), a 15-bedded intensive therapy unit. Both the ICCU and MICU would be shifting to the newly constructed building near the physiotherapy college known as the ‘Superspeciality Building’. "Separate isolation ward for management of patients of highly communicable diseases( like e.g. Swine flu ) is available." 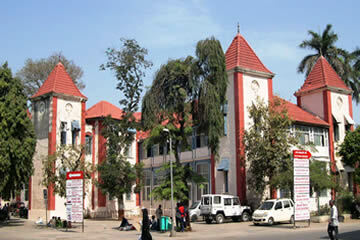 The ART centre is run by the department of medicine since 21st January, 2009 in OPD 26 on the first floor of the common OPD building. Around 5798 patients are enrolled in the centre, one of the largest in Gujarat. Dr Mahendra Parmar, Professor, is presently working as the Nodal Officer of the ART centre. ART centre has average daily OPD of about 270 patients . 1) Practical examination is taken at the end of each clinical term and internals are calculated based on these marks. 2) Under graduate students have to fulfill 80% criteria of presence for them to qualify to appear for Final MBBS Exams. - Internal marks are calculated on the bases of these theory exams. 3 Practical examination is taken at the end of each clinical term and internals are calculated based on these marks. 4) Under graduate students have to fulfill 80% criteria of presence for them to qualify to appear for Final MBBS Exams. 1)	Case presentation of common clinical cases on Monday 4:00 to 5:00 pm. 2)	Two Case presentations of unusual and rare cases on Thursday 4:00 to 5:00 pm. 3)	Assignment presentation on Wednesday between 4:00 to 5:00 pm. 5)	Every PG is allotted a Topic- for thesis on which work is started after clearance from IECHR submitted before final exam. 6)	Final exams of the PGs, are taken at the End of 3 years, which comprises of both theory exam (4 papers) and practical exams. 1)	Ist year- 6 Months in male and female wards by rotation. 2)	IInd year- Posted in Neurology/Nephrology, ICU and ICCU for 4 months each by rotation. Posted in casualty on Emergency day. 3)	IIIrd year- Posted in male and female wards by rotation. •	Attend OPD and specialty clinics on their respective days. •	Attend medical camps in rural and urban areas. 1. A study of prevalence of diabetic Nephropnthly in recently detected cases of type-2 Diabetes mellitus with special emphebis on hypertension, hyperdwles terolemia and obesity International journal of Advances in medicine (IJAM) March- April 2018 vol-5 Issue-2 page -351-355. Dr. Vitan Patel, Dr. Minal Shastri, Dr. Nisha Gaur, Dr. Prutha Jinwala, Dr. Abhishek Kadam. 2. Acute Viral Hepatitis and its associationwith Lipid Profile. International Journal of Scientific Research.Vol 7/ Issue2/ Feb 2018. Jaya Pathak, Nibha Jain, Iti Parikh. 5. Clinical Profile of patients of Alcoholic Cirrhosis of Liver in a tertiary Care Hospital of Gujarat. IJSR Vol 7/ Issue 1/ Jan 2018. Jaya Pathak, Shivangi Gharia, Kesar Prajapati. 7. Obesity markers and its association with end-organ dysfunctions among patients with metabolic syndrome in Western India, Original article,International Journal of Research in Medicine July-September2017Volume 6 Issue 4;4-8. Gandhi Archana U, Shrivastava P., Patel S. V, Joshi C. C.
india.international journal of medicine research. Vol 3/issue 2/ april 2018/ page 44-46.ayush jain, Dr.Mmahendra parmar. 1. Dr.Prutha Jinwala .1st prize in poster presentation on ‘Adult onset Langerhans cell histiocytosis as a rare cause of headache’ at APGCON 40. Fortnightly Guest Lectures by various sub specialists. APGCON 2015 Mediquiz winner- Dr Hiren Patel and Dr Varun Vadodariya. Cleveland Clinic Educational Foundation – Recognition for excellence in Teaching- Dr Rushad Patell. Two of our post graduates werer declared winners in state level conference on Diabetes. ( RSSDI) for Postor and Paper presentation in 2017. Participation by our faculties as speakers, chairpersons and judges.